For years I had my pictures printed and shipped to me so I have an overload of 4×6 prints that I need to scrapbook. I tend to want to scrapbook newer photos so these older pictures just sit in photo boxes. I’m on a mission to get these pre-printed photos scrapbooked! When going through the photos, I came across these older photos of Aidan. Be still my heart! I remember everything about this day like it was yesterday. The faces he would make (just like these) when the wind would blow or the sun was in his eyes. How his smile would change as the day would go on because he was exhausted from having his photo taken. How I wish I could go back and tell myself not to worry about getting the “perfect” photo. How much I will cherish these memories when he gets older. How these photos will flood back the memories of him at this age. So much of his personality is captured in these photos and I. LOVE. THEM! These photos were taken at a local pumpkin patch that has a lot of kid friendly Halloween activities so I gravitated to the Haunted House Cut File from The Cut Shoppe. I cut the cut file on a houndstooth pattern paper and cut off the words “Haunted House”. I then adhered the cut file to my background patterned paper. After it was adhered, I added handstitching to the spiderweb. Stitching, whether it is handstitching or machine stitching, adds so much texture to a layout! Handstitching does take awhile to complete, but it is ALWAYS so worth it! Plus it gives me an excuse to put a movie on and just sit on the couch! I moved onto embellishing once I had the handstitching complete. I grabbed a lot of odds and ends from my stash and started layering the embellishments around my photos that I had positioned in the upper left & lower right corners. One of the struggles I have with using these older photos is they are 4×6, which is not a size I love, and at this point in time I was not editing any of my photos. I edit all of my photos now so I sometimes cringe at the quality of these older photos. But as I mentioned above, I’m on a mission to use these and not let them go to waste by just printing a new, edited version. I trimmed the 4×6 photos into squares, which is a size I prefer to use, and find much more manageable. I used a large die cut from my stash in the center of the webs for my title. I also positioned the year the photos were taken on both sides of that die cut. I added my journaling around the spiderweb and also added a bit of stamping under the photo. 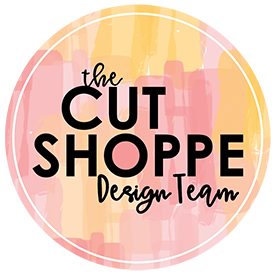 You can find more Halloween inspiration from The Cut Shoppe Design Team on The Cut Shoppe Blog, and remember to visit The Cut Shoppe Etsy Store to check out all of the cut files and digital collections!